2019.04.12 Some People - Ilhan Omar was on video saying the terrorist supporting, anti-semitic CAIR, was founded because they recognized "Some people did something", meaning Islamic Terrorists took down the Twin Towers on 9/11. Fair was actually founded nearly a decade earlier. President Trump tweeted the video because it shows the truth about the left's PC apologism for 9/11. The left couldn't argue the facts, so they put their lie-machine in overdrive. WaPo FakeNews'ed by trying to claim that Bush said it too... before we'd identified the source of the attack (as if the context was the same). Atlantic tried to deflect for her. Other operatives for the DNC pretended that Trump was inciting violence or islamaphobia by showing the video of Ilhan's own words. This is moronic, the Republicans love her! She's the poster-child for stupid, racist (anti-Semitic), Politically Correct terrorist apologism. They need her to run-against in 2020. They're more likely to hire a security detail for her, than wish any harm on her. But still, Dems started a "#IStandWithIlhan", and cries about poor her, for having her own message magnified. The fake pearl clutching is an insult to our intelligence, and is obvious gaslighting. 2019.02.06 Assassination "Joke" - Jemele Hill (of ESPN and the Atlantic) made a tweet (now deleted) saying AOC should interrupt Trump's next State of the Union address, with the following quote, "GETCHO HAND OUT MY POCKET". This was what one of Malcom-X's killers said before murdering him. Jemele deleted the tweet and apologized, but few believe it was a joke. The reason for the firing was elucidated in the memo: his views on abortion (which the editorial staff was aware of before they hired him), was that of science: and that a fetus is a human life. His beliefs were of the side that killing a fetus was tantamount to murder (and that abortionists should be punished accordingly): a view far to the right of my own. That view is no more morally offensive than the other extreme that says full term abortions of viable babies is nothing but eliminating bio-waste. That latter is the view which plenty of staffers at the Atlantic hold, including Jessica Valenti, who also writes for the Washington Post, and The Guardian US, without any concerns of retribution. For his callous and violent remarks (that abortionists should be punished), made years before the hiring, Gates claimed that Kevin Williamson needed to be let go. 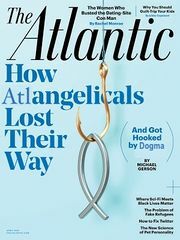 While the Atlantic has no problems paying the salary of Ta-Nehisi Coates, who compared a police officer who shot a Howard University student to the 9/11 terror attacks, or when contemplating income inequality between Blacks and Whites in America he opined longingly that such corrections "don’t tend to happen peacefully". And in response to riots in Ferguson he defended the violence with, “What clearly cannot be said is that violence and nonviolence are tools, and that violence—like nonviolence—sometimes works.” He sounds frighteningly identical to the same things that the Alt-Right (Richard Spencer) claims, but since it's from an alt-left view, the Atlantic doesn't want to condemn or fire, they want to ponder the intellectual nuances of the charges. So the hypocrisy of tolerating one extreme, while being intolerant of the other, is something that Gates (editor) lost sight of. Or just never really cared about. Kevin got the opportunity to do what he should have been able to do at the Atlantic before his firing: he wrong a column expressing what his actual views are (instead of snippets out of context). Nothing in this, seems to be worthy of getting let go. But the Atlantic has differing standards based on political leanings. I learned that while the Atlantic’s founding motto was, “Of no party or clique”, that dream is long dead. We also learn that anywhere that progressives get a voice, they will ruin it for others. They have the tolerance of complete intolerance: there is no party or clique at the Atlantic, because like California, Nazi Germany, or anywhere else the progressives rule, they demand complete and utter subjugation to the will of the collective: thus they are not "of" the clique, they are the clique. This page was last edited on 20 February 2019, at 15:50.